Don’t expect 5 star resorts, bars, ATM’s, Air-con, numerous restaurants or even WIFI on Koh Tarutao Island Expect relaxation, lonely beaches, clear seas, caves, hiking, biking, waterfalls, limited electricity, basic hut type accommodation and camping along with a hand-full of cafes offering local staples. There is a National Park fee of 200 Baht for foreigners (adults), 100 baht for children, 40 Baht for Thai nationals and 20 Baht for Thai children. If you hold a work permit you should be able to enter for the Thai national price. The entrance fee will also cover you for other islands in Tarutao National Marine Park. Koh Tarutao (sometimes pronounced Ko Tarutao) is the largest island in the Tarutao National Marine Park being 26 kilometers long and 11 kilometers wide. The Marine Park consist of 51 islands in total that make up 2 groups: Tarutao group to the East (closest to the Malaysian island of Langkawi and approximately 20km from Pak Bara) and the Adang-Rawi group to the West where the popular Koh Lipe island lies. Tarutao National Marine Park is in the Southern Thailand province of Satun and situated in the Straight of Malacca – close to the Malaysian border. 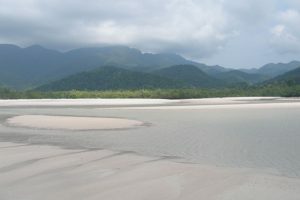 Tarutao National Marine Park was first established in 1974 by the Royal Forest National Park Department. It became Thailand’s second Marine National Park. In 1982 it was also listed as an ASEAN Heritage Park and in 2002 Koh Tarutao was the setting for the American reality TV show “Survivor”. However, Koh Tarutao also has a darker and more chequered past. In the late 1930’s and early 1940’s it was home to 3000 prisoners including some political prisoners. Among them was the grandson of King Rama VII, Sittiporn Gridagorn. Tales of crocodiles and sharks deterred many of the prisoners from trying to escape. During the Second World War Koh Tarutao was cut off from the mainland and supplies became scarce. Starvation and Malaria were both rife and may of the prisoners and guards turned to piracy in the Malacca straights. This was mostly quelled by British troops after the war. The prison closed shortly afterwards and the surviving prisoners returned to the mainland. A few farmers and fisherman took up residency shortly after this and very little of the prison remains today. How to get to Koh Tarutao? Most people arrive on Koh Tarutao from Pak Bara or Koh Lipe. The boats that service Koh Lipe from Pak Bara make regular drops at Koh Tarutao on the way to Koh Lipe and it is the same arrangement with the reverse journey. The ferry from Koh Lipe to Pak Bara make regular drops at Koh Tarutao. You can follow this link to make a booking to Koh Tarutao from anywhere in Thailand. Or you can complete the search form below. The search form will, if you wish, combine the journey with a joint train, bus or plane ticket with your ferry ticket. The only thing you need to be mindful of is arriving at Pak Bara before the last ferry of the day. It’s worth noting that Hat Yai is 117 km (2 hours from Pak Bara). I will also go into a little more detail below on how to get there from certain locations. You can take the bus, train or plane to Hat yai and from there you can get a transfer to Pak Bara pier. You can use this link to book a joint plane, train or bus ticket with transfers to Koh Tarutao or, alternatively, you can arrange this yourself. There are around 8 flights from Bangkok to Hat Yai per day. Trains depart from Hua Lamphong train station and buses go from the Southern Bangkok Bus Terminal (Sai Tai Mai) or the Khao San Road and drop off at Hat Yai Bus Terminal. In order to go from Langkawi you would first need to go to Koh Lipe to pass through immigration. 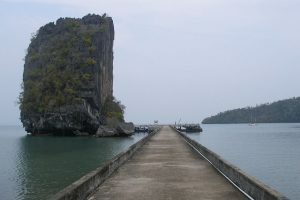 From there there are numerous transfers to Koh Tarutao and the surrounding islands. You don’t need to book in advance however, if you wish, you can use this search form. It is also worth noting that the ferries from Langkawi to Koh Lipe do not operate all year round. They only operate during the high season – mid October to mid June. So please check Prior to departure. As previously mentioned, the boats servicing Koh Lipe from Pak Bara and the return journey Koh Lipe to Pak Bara also service Koh Tarutao. There are plenty of travel agents on Koh Lipe where you can buy a ticket. Simply visit one a day or two before you wish to travel and they will provide you with a ticket. Many people that visit Koh Lipe stop on route at neighbouring islands in the Koh Tarutao National Marine Park. You can buy day trips and snorkelling trips from Koh Lipe. As previously mentioned, there are no Koh Tarutao hotels or resorts. Bungalows and campgrounds are provided by National Park’s headquarters at different locations. Electricity is limited between 6pm-6am depending on type of accommodation. You can also bring your own tent if you prefer and camp for as little as 30 Baht per night at Pante, Mo lae or Adung. Tents are also available to hire from around 200 Baht. Email [email protected] for reservation or visit this Thai government national park site for more information as prices could be subject to change. The DNP site is a little difficult to navigate however they do respond to emails after a day or two. It is also worth noting that really it’s unnecessary to book in advance the island is rarely full you can just pay on arrival. However if you would prefer piece of mind please email them. Most of the accommodation on Tarutao is at Ao Pante. This is also the location for the National Park Headquarters. This is the main entry point to the island and where the ferry arrives. The camping area provides public facilities including toilets and showers. Bungalows are from 350 Baht per night. Tents from 200 Baht but can’t be booked in advance. The accommodation at Mo Lae Bay is of a newer construction. These bungalows come equipped with a hot shower and a fan. Bungalows are from 420 Baht per night. Tents from 200 Baht but can’t be booked in advance. Ao Son Bay is quiet and more remote than Ao Pante Mo lae. People do however venture here for the beautiful sunsets and it also does have a restaurant serving good food. Bungalows are from 420 Baht per night. Tents from 200 Baht but can’t be booked in advance and again facilities are provided. 1. Bike Mountain bikes are available for hire from 250 Baht per day. A great way to get around and the roads are good. 2. Hike Take some sturdy walking shoes with you. There are plenty of hikes to do. Take the nature trail to Ao Talo Wao. You can also visit the old prison at Ao Talo Wao - the political prisoners were kept at Ao Talo Udang at the South of the islands. There is also a park ranger station located here. 3. Boat Take a long-tail boat through the mangroves to Crocodile cave (caves on the island are tidal so it's well worth going with a guide as kayaking into caves can be dangerous). 7. Climb to the viewpoint at Pha To Bu cliffs. This takes about 20 minutes in total and is located just behind the Park's headquarters and overlooks Ao Pante beach and the neighbouring islands. There are plenty of opportunistic Macaque monkeys on the island. It is common for them to try and steal food from your bungalow, tent, bags and sometimes even from your plate at a restaurant. 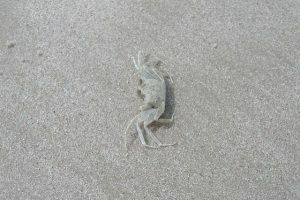 Sand flies are tiny, yet their bites can be very itchy and painful. Most of the bungalows have Mosquito nets so pack some repellent and cover up with some light clothing. There are no ATM’s on Tarutao so bring enough money for your stay. Food and drink is slightly more expensive than the mainland so add a little extra. Bring any medication you require as well as bite cream and Mosquito repellent. A light long sleeve top and bottoms will also help keep the sand flies and mosquitoes away.